Going Interactive - Creative Digital Agency > News > Old Blog > Drink Coffee. Do Good. A simple concept to think about. Well, it’s actually true. The Land of 1,000 Hills Coffee House in Roswell IS doing good. The Land of a Thousand Hills Coffee is a place where you can have a high quality cup of coffee and know that it also provides a Living Wage to coffee growers, micro-finance loans to widows, and engages redemption in a very tangible way across the world. Land of a Thousand Hills Coffee is on a mission to provide excellent coffee, support sustainable economic development, and to be a catalyst for reconciliation in Rwanda. Besides all the good they do… it tastes good too! A warm welcome awaits you at the Land of a Thousand Hills Coffee House in Historic Roswell, GA! We boast a laid-back atmosphere, large outdoor patio, free wireless internet, tempting pastries and desserts, and excellent coffee by the bag or the cup. Going Interactive donated free of charge our services (to help do some good) and designed this WordPress driven blog style site for the local Roswell location. 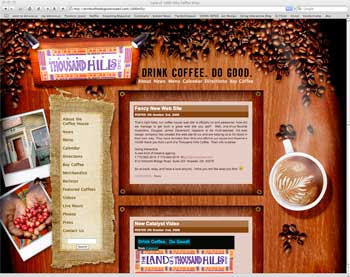 The coffee house can now totally control their site, upload photos, videos and more. If you’re in the area, stop by and drink up!